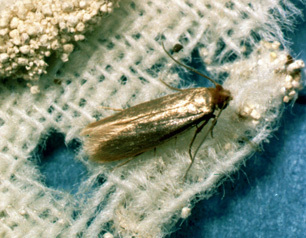 Napthalene was once used to fend off clothing moths. Naphthalene is an organic compound with a familiar odor; it's the chemical used (until recently) to produce mothballs. It's also used in insecticides, resins and organic chemicals. According to the EPA, acute naphthalene exposure can cause “hemolytic anemia, damage to the liver, and neurological damage,” with symptoms including “headache, nausea, vomiting, diarrhea, malaise, confusion, anemia, jaundice, convulsions, and coma.” The agency classifies it as a “possible human carcinogen” and warns that long term exposure can lead to cataracts. Naphthalene can be treated with activated carbon.